A treasure of a home and hostess! A perfect Georgian family house with all the well proportioned elegance you’d expect. 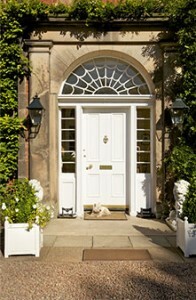 This luxury B&B accommodation North Berwick is featured in many interior magazines. 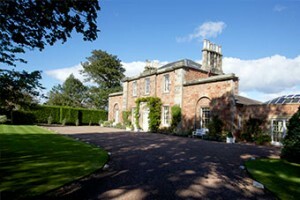 The Glebe House has the coveted Four Star Gold Award which it has held for the last five years. This 1780’s former Manse sits surrounded by acres of lawns and trees in the picturesque seaside town of North Berwick, not far from Edinburgh. Gwen has a real eye for design and colour and has done a most stylish job of decorating. From the front hallway a door opens to the downstairs wing, with the four poster double bedroom, en suite bathroom and cosy sitting room. There is also a large sitting room for guests to relax in. Upstairs are two more lovely bedrooms and bathrooms. Breakfast is served round the long dining room table and there is no shortage of restaurants and pubs to walk to for dinner. Golfers are in heaven staying here! There are numerous golf courses within easy distance including Muirfield, Gullane and of course North Berwick. A half hour train ride finds you at the base of Edinburgh Castle, which makes for hassle-free day trips to all the shopping and historic sights. North Berwick’s beach is a two minute walk away as is the High Street with its shops and restaurants. Bass Rock, an important nesting site for sea birds can be visited by boat from the Harbour, and the internationally renowned Scottish Sea bird Centre is nearby. There are castles, museums and a whisky distillery close at hand too. Gwen and Jake have lived at the Glebe House for thirty five years and will be delighted to offer advice on where to go and what to do.